Often referred to as the Grand Canyon of Pennsylvania and the Pine Creek Gorge, the PA Canyon area stretches for over 45 miles with depths of nearly 1500 feet. Its dynamic topography creates many scenic wonders, including steep canyon walls and waterfalls. The PA Grand Canyon is part of the Tioga State Forest, beginning just south of Ansonia, PA, near Wellsboro. One of the most popular attractions to the canyon is the Pine Creek Rail Trail, a converted railroad bed that travels along Pine Creek Gorge at the floor of the canyon. USA Today cites the Pine Creek Rail Trail as one of the 10 great places to take a bike tour in the world. Because of the gentle grade, the trail offers easy pedaling, hence it can be experienced with minimal physical impact and basic biking gear. And of course it also makes for good hiking and running. With numerous developed trails, the Grand Canyon of PA is a hikers paradise. maps Floating, boating, fishing, hiking and biking are all part of the area's available outdoor adventures. 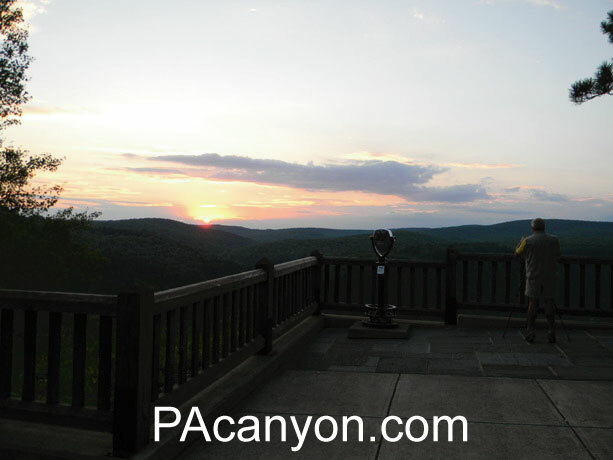 The PA Grand Canyon State Park areas display spectacular views. Colton Point on the west rim and Leonard Harrison on the east rim of the canyon are the must see vistas to visit. Also find picnic and camping areas. The PA Grand Canyon area offers many Attractions and Activities, all the elements needed for a fun vacation or a weekend getaway. When it's time for some food and shopping, the gaslight lined streets of Wellsboro Pa. and the quaint small town Victorian charm makes it a great place to visit... And your visit to the PA Grand Canyon is not complete without a journey to nearby Corning, NY and the Finger Lakes Wine region ... truly an enjoyable outing. As a native to the PA Grand Canyon area it has been my privilege to enjoy the wonders of our crowned jewel. Some of my favorite activities include hiking, biking and boating in the Pine Creek Gorge. Like many visitors to the canyon, I enjoy hiking the Turkey Path at Leonard Harrison State Park. I often joke with visitors that this hiking trail is one mile down and eight miles back up. But in all seriousness, this is a steep hike on a well developed trail, approximately one mile in each direction. There are steps built in along the hiking trail with several places to stop and rest. Some nice views of the canyon and the Little Four Mile Waterfall can be seen on this hike. The trail leads to the bottom of the canyon to the Pine Creek Rail Trail. Be sure to check trail conditions and weather before starting this or any hike, and be certain to wear proper clothing and footwear. There are picnicking facilities at Leonard Harrison State Park including several covered pavilions. You'll also find a gift shop, vending machines, water and bathrooms. This is a great place for family gatherings, a spot at which our family reunites each year. One tip: If you want to avoid crowds, visit Leonard Harrison State Park during the week as opposed to the weekends. 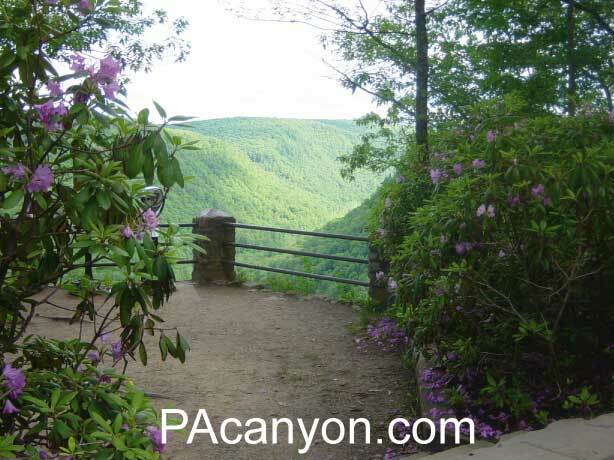 More Hiking: The Overlook Trail at Leonard Harrison State Park is a short walk, a loop just slightly more than a half mile, with a wonderful southern view of the PA Grand Canyon from otter view. And of course, The Pine Creek Rail Trail, one of the most popular Pennsylvania attractions, offers miles of easy hiking and biking along Pine Creek and through the Pennsylvania Grand Canyon. On the opposite side of the canyon, almost directly across from Leonard Harrison State Park is Colton Point State Park, the more rustic of the two parks. Though not as developed, it is a great part of the canyon area to explore. I enjoy the drive from rt.6 out Forest Road to Colton Point State Park. This is a scenic winding road that climbs to the vista views from the park and continues past the park. Visitors can view Four Mile vista on this tour and can explore many back roads in the canyon area. Home to Bald Eagles and river otters, white tail deer, black bear and wild turkey, and thousands of acres of State forest land that surround The Pine Creek Gorge . The perfect vacation is here at the PA canyon.